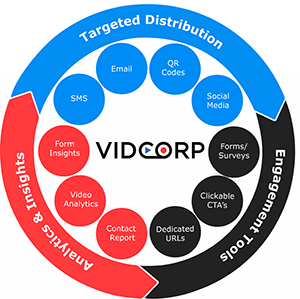 Trying to manage your video communications strategy across multiple platforms, while keeping up with your digitally-empowered audience, can be a headache – the costs stack up, administering all the moving parts feels like a juggling act, and disjointed analytics means you never get a deep understanding of how your content is performing. VidCorp exists to take this pain away. To do this, we’ve built the only online video platform designed to handle everything – hosting, personalised distribution, in-depth analytics, a suite of engagement tools. And, it’s all effortless to use. Stay one step ahead – our latest adaptive streaming technology ensures that your videos play on any device, including feature phones. Cloud hosting gives you control and ensures easy campaign management and insights – anywhere, anytime controlled using the VidCorp platform. All video, customer, and other sensitive data is stored onshore in Australia using the most robust technology, including regular third-party security audits. Discover who is watching your videos and for how long – view campaign-level stats and dig deep into your engagement metrics on an individual level. Combine the persuasive push of video with the conversion power of customised landing pages – all built and controlled using the VidCorp platform. Get their attention with video, then use our form and survey creator to transform interest into leads or capture other valuable intel. Enrich your video communications with supporting documents. PDF, Word, PPT, Excel, CSV and TXT files are all supported. We integrate with leading CRMs, LMS, Payroll and analytical systems via API and integrations.